I now live near (well, within an hour’s drive) of Long Island Sound, and I wanted to learn more about the new environment I seem to be stuck in. I signed up for a short oceanography cruise with Project Oceanology in order to spend some time on the water. I was excited to see some things I didn’t expect! I’d never seen an actual live flatfish, the amazing fish with eyes that migrate to one side of their body as they grow. What I didn’t know was that there are actually two kinds of flatfish in New England. 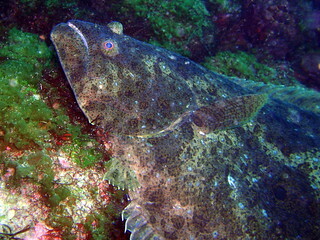 Flukes are are left-side-up fish. In other words, their left side faces up and their right eye migrates to the left side of their body. Flounders are right-side-up fish, so their left eye migrates to the right. How crazy is the world that there are both right-eyed and left-eyed flatfish lying on the bottom? Nifty! The biggest surprise was that our water sample pulled in a huge number of little Ctenophores, also known as comb jellies. These tiny little animals are just about invisible if you are in the water–they are usually smaller than an acorn. Ctenophores are a major part of the food chain in the ocean, and they superficially look like jellyfish (but can’t sting). When we pulled up the water sample, what got dumped out looked like a lot of….well. Snot. Ctenophores are oddly firm and jelly-like, despite being only two cells thick. A fellow boater holding one described it as a “tiny breast implant,” which sort of gives you a sense of the consistency and color. The most fascinating part of comb jellies, though, is how they get around, and their incredible beauty. Here’s a nice little film that gives you a sense of how lovely and magical they are when not blobbing around in a bucket so I can look at them. What unexpected discoveries have you made recently? The Afternoon Inquisition (or AI) is a question posed to you, the Skepchick community. Look for it to appear Tuesdays, Thursdays , and sometimes Sundays at 3pm ET. Haha, yes, it was like a tiny breast implant! Those were both gross and cool. They look less lazy in the video. I don’t know of any recent discoveries that I’ve made, but when I was 4 or 5 years old, I discovered that by coloring over a blue crayon spot with my yellow crayon, I made green. I thought I had discovered some new way to make colors and that I was the smartest person in the world. Wow, I’ve known of Flukes and Flounders since I was a kid fishing with my Dad, but I never heard that left eye / right eye thing. Neat! We did the microbats overnight expedition a while ago (http://www.earthwatch.org/australia/exped/vanderree_short.html) which was fascinating. Mice! With wings! That purr! And fly just like insectivorous birds but in the dusk/dark. People often mistake bats for birds when they see them. But little birds don’t go flying round at high speed when there’s barely enough light for people to see by. The cool thing is that they live all over the city so there are probably some near us. Unfortunately a standard wildlife camera is useless for this because the wide sensing angle (which you need for bigger animals) means that it triggers on everything except bats. So we have done a bit of touring all the old native trees in our neighbourhood around dusk looking for microbats. Recently on holidays in Bali, we “discovered” Kopi Luwak (civet coffee)! This was completely serendipitous, and I thought we should investigate, bearing in mind the, er, Special Interest of the Skepchick community in all things coffee. Your intrepid investigator took one for the team, and can report, the product is markedly improved over the usual Balinese coffee. The latter I find to have a rather mild and pleasant nutty flavour, while the Civetted version is a really good strong top quality espresso flavour, with enhanced flavour and markedly decreased bitterness. We paid 5 bucks for a cup as opposed to the reported 50 bucks demanded in New York. As for hygeine concerns, the beans are excreted with husk intact, and are carefully washed and peeled prior to roasting, so the amount of E Coli present is reported to be even less than in standard coffee. So far no ill effects! The civets are very cute but extremely aggressive, and therefore difficult to breed, as a fight to the death is more likely than mating! So neat! There’s so much to discover under the sea! Here’s a little inspiration from my homeboy Sebastian: http://www.youtube.com/watch?v=C8OBlq_svBY. I recently discovered that my city (Halifax, Nova Scotia) has the highest concentration of PhD-trained ocean scientists in the world!! It’s cool when you find out about all the knowledge in your own backyard. But even with all the knowledge we have here, there’s still tons more to learn.